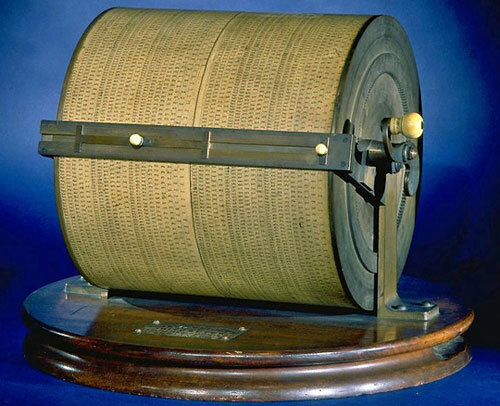 In 1860s, Elizur Wright (see biography of Elizur Wright), an American mathematician and abolitionist, sometimes described as the father of life insurance in the United States, invented his Arithmeter (a large cylindrical slide rule, equivalent of a linear slide rule some 20 meters long). He patented it in 1869 (US patent 93849), and sold it to insurance companies for $500. Wright also used the Arithmeter in his successful business for calculating the value of insurance policies, which he set up together with his eldest son. 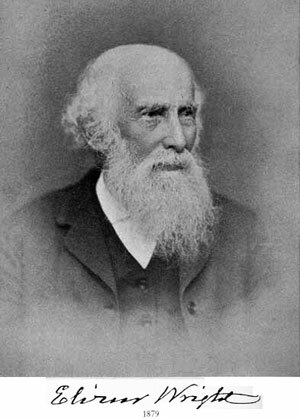 Joseph W. Fowle, a Boston machinist and inventor (holder of quite a few patents for various devices), is known to have built some arithmeters for Wright. At least 10 machines survived to our time, one of them in the collection of National Museum of American History in Washington, D.C. (see the image below). The measurements of Arithmeter are: 36 cm x 48.2 cm x 48.2 cm. It is made of brass, wood, paper and ivory. The device has a wooden case (measurements: 41 cm x 52.8 cm x 52.8 cm) with two metal handles and a key. The machine consists of two rotary adjacent cylindrical brass drums, each covered with paper and mounted horizontally in a round brass frame, which is screwed to the round wooden base. Two indentations in the side of the base assist with lifting the instrument. A crossbar attached to the frame extends across the length of the drums. Two arms (indicators) slide across a groove in the bar. A brass handle with an ivory knob on the right side of the frame rotates the drums. An ivory button on the left side of the frame operates a brake-shoe. When the button is locked in a vertical position, the two cylinders turn together. When the button is horizontal, only the right cylinder turns. The two drums are marked identically. Each drum has a spiral of 20 turns around the cylindrical surface, divided according to the logarithmic scale upon spiral or helical lines, with printed numbers to the right of each division. The first digit of a number is read from the crossbar, and the remaining three are printed on the drum. 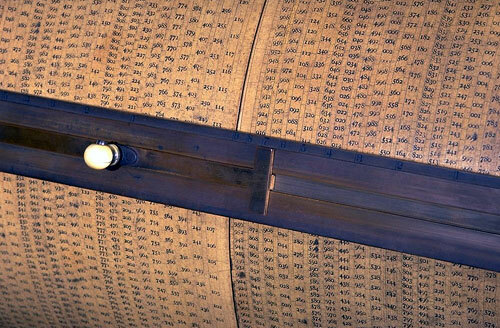 The markings include every digit from 0 to 3000; every even digit from 3000 to 6000; and every other even digit from 6000 to 10000.